the fash pack: we have to go to H&M next month! 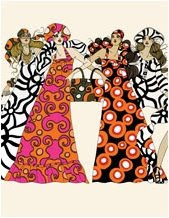 "Marimekko is licencing its patterns to H&M's summer 2008 collection. 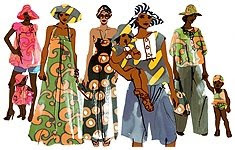 Marimekko Corporation and H & M Hennes & Mauritz AB have today signed a license agreement whereby Marimekko licenses some of its popular patterns from the 1950s, 1960s and 1970s to H&M's summer collection 2008. The impressive collection of around 50 products will be sold in H&M stores in 28 countries. 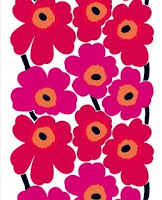 'Our design team has long admired Marimekko's vivid patterns and colours. When our designers came up with the idea of creating a collection with Marimekko patterns, it felt very natural and timely. 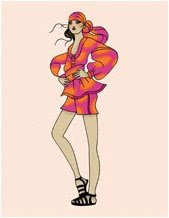 The summer collection 2008 will be joyfully fresh like a vitamin injection,' states H&M's head of design Margareta van den Bosch. 'H&M is one of the trendiest and most successful fashion houses in the world. I see a great value in our co-operation. I believe that it will enhance Marimekko's international recognition among young and fashion-conscious consumers,' says Kirsti Paakkanen, President of Marimekko. It’s all about the energy of summer. This season H&M brings a burst of life to the fashion scene with its tribute to Marimekko, the Finnish textile company that has thrilled since the 50s with its bold, bright colour. Using prints from the famous Marimekko archive to create 70 pieces for men, women and children, the H&M design team will take you all the way from the city street to the heat of the beach. The collection will be sold in H&M’s stores on all 28 markets from April 10, 2008. Selected parts of the collection will also be sold at 10 Corso Como Milan and 10 Corso Como Seoul, and at Dover Street Market in London. 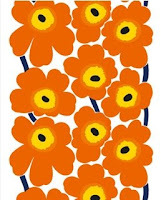 Marimekko is well known for vibrant bold simple prints. 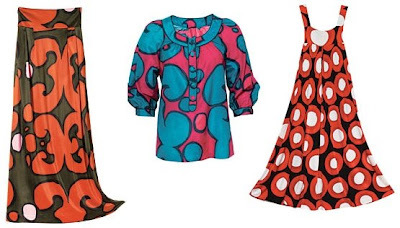 It was fashion icon Jackie Kennedy that put Marimekko on the international map when she wore their dresses during her husband’s 1960 presidential campaign. 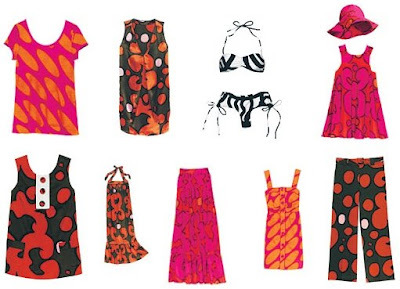 Since then, Marimekko has always symbolised optimism and positivity, which makes it a perfect match for H&M. Dipping into the massive 60s archive, the H&M design team have taken these fun retro prints and given them a very modern twist. 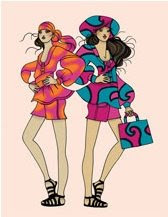 Pinafores, smocks and shorts are the must-have women’s styles that sing out with holiday spirit. Certain designed pieces have been given extra detail for example three buttons on a cotton/silk mix apron dress. 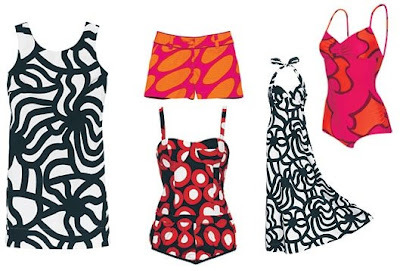 When it comes to the beach, the Tribute to Marimekko has both 50s-style one-piece swimsuits and bikinis, as well as sun-hats and versatile scarves that can be wrapped high on the head, or easily gathered into a sarong. For men, the striking Marimekko stripes are used on what will become the favourite T-shirt of the season. There are also short-sleeve shirts and shorts in more intense prints. 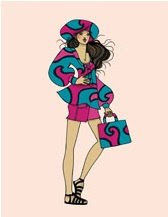 For children there are bright fun matching prints on apron dresses, sun-hats, skirted swimsuits and even a patterned teddy bear!" and actual pieces! (courtesy of nymag.com) see you in, er, hong kong in april! I heard a major dept store here in Manila is bringing H&M here. Is it true? Aaaaack! 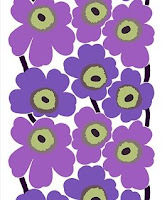 Marimekko is my design kryptonite! Me want some H&M/Marimekko stuff! Cute, cute, cute! In 2006, there was also a collaboration with Marimekko and Crate & Barrel, and that stuff was adorable too! Hmmm, a certain ex-editor/photographer's wife was my shopping BI and got to me to buy a Marimekko bag with the classic Unikko "Poppies" design. It's the first pricey bag I bought, even though it's not that pricey compared to real "IT" bags. But my new bag is an "IT" as far as I'm concerned! I wanted to buy even more Marimekko stuff… so maybe I'll get it in an H&M! ewwww. another wannabe? this is just so tragic. what's going on with the society? im sorry for the harsh statement but woman, or old lady or whatever. get real. dont live a lie like what most people do. 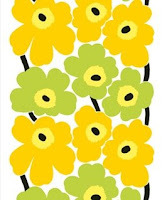 I love Marimekko and I lament its demise here in the Phils. JustFinn used to distribute it locally a few years ago (fabric for interiors, admittedly johalia but so beautiful), though I don't know if Rustan's Makati still carries their lovely Marimekko fabric bags (totes cost P2,000, structured bags P2,500 and up, I can recall). I'm not a big fan of prints but, oh my, those prints truly are lovely! I hope what the anonymous commenter heard was true.